Our large range of tile and stone colors, patterns and textures will fulfill all your design needs, at a great value. Aztec Flooring carries tile and stone in every form - mosaic tiles, porcelain, tumbled marble, glass tiles, metal tiles and much more. We offer all your favorite national tile and natural stone brands such as Dal Tile, Mohawk, Emser Tile and Marazzi to name a few. 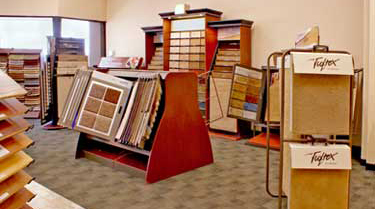 Aztec Flooring offers the largest selection of carpets to fit any style or budget. Offering style, durability and comfort at a great price and wide range of colors, patterns and textures, Aztec will meet all your design requirements. Aztec Flooring carries your favorite national brands such as Mohawk, Shaw, Alliance Textiles, Tandus Carpet as well as many other carpet brands. Nothing matches the beauty and warmth of wood. Aztec Flooring offers the largest array of hardwood flooring to fit any style or budget. Choose from an endless variety of traditional and exotic wood species such as oak, maple, walnut, hickory, birch, Brazilian cherry, and tiger wood at great saving. Create an impressive decor and add value to your home with genuine hardwood flooring. Laminate floors combine natural-looking designs with a tough, durable finish. Showcasing everything from a low-luster to a rich, high-shine finish, laminate floors can be used in any area of the home or office. As an economical choice, laminate floors will maintain their original look despite heavy traffic use and are, therefore, perfect for commercial and residential settings.